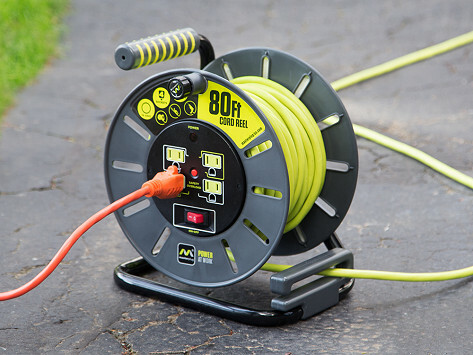 Combat unruly extension cords with this extension cord reel. It keeps cords neatly wrapped up, and it helps streamline tangles thanks to four built-in sockets. Dimensions: 40': 10" x 8" x 6"; 80': 10" x 11" x 8"
Weight: 40': 5 lbs. ; 80': 11 lbs. If you need multiple temp outlets in the yard, corner of a garage/workshop or renovation project, you could use this. It lets you control the power at the outlets (on/off). CON: watch your total amperage over the distance of the extension. This is one of my best buy online. A real useful item to my camping equipments. It powers all my portable devices without a glitch. This Cord Reel is stable, well made and easy to use. I love it. I have looked for years for a reel that is made this well and is easy to use. It is a good purchase and I recommend it. 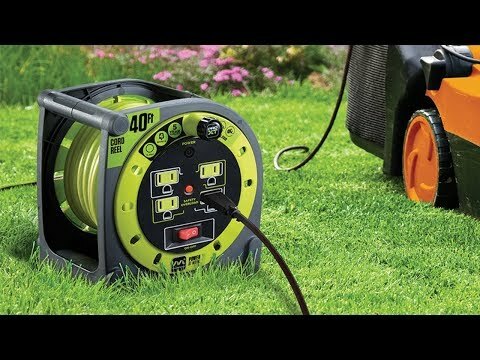 Organize your prone-to-tangle extension cords with this extension cord reel. Masterplug takes otherwise-unruly cords and makes them easy to access, mount, and store. The four outlets embedded onto each reel’s side can handle up to 13 amps and protect against current overload. Plug in anything you might need for projects indoors or out. And, if you already own extension cords, their empty reel mount attaches to your wall and can hold a cord up to 50-feet long. Lightweight and easy-to-store, Masterplug helps you power up and tidy up.